This entry was posted in Uncategorized on 6, November, 2018 by admin. As you are no doubt aware, Aasia Noreen, better known as Aasia Bibi, a woman from the minority Christian community in Pakistan, and a mother of five, was imprisoned for almost ten years, eight of them on death row, on false charges of ‘blasphemy’ (roughly translated as sacrilege). this ‘crime’ even before their cases could be heard by the courts. On October 31, the Supreme Court of Pakistan acquitted Aasia Bibi of all charges and ordered her release from jail. However, her life is in grave danger at the hands of fundamentalist extremists who have threatened to kill her. It is most unfortunate, but the government of Pakistan might not be able to guarantee their security. Aasia Bibi, and her family, have already suffered grievously. There is the great likelihood that they might suffer an even more violent and tragic fate. 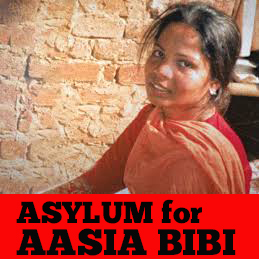 That is why the Committee of Progressive Pakistani-Canadians requests that your government urgently grant Aasia Bibi and her whole family asylum in Canada. This entry was posted in Letters on 6, November, 2018 by admin. as community organizations for us to challenge this bigoted discourse. c) Provide language to challenge these systems. 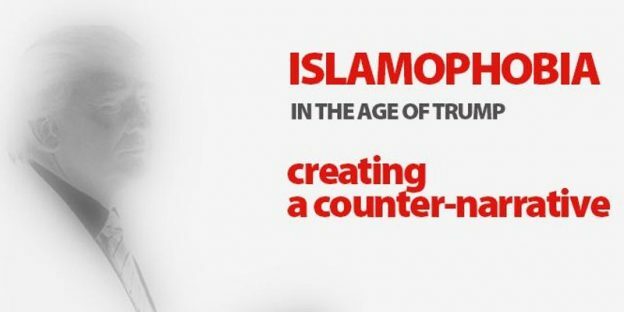 Alia Hogben is the Executive Director of the Canadian Council of Muslim Women. In 2012, Hogben became the second Canadian Muslim woman to be awarded the Order of Canada for her work in the area of women’s rights. Syed Hussan is a researcher, writer and campaigner based in Toronto. He organizes as part of and alongside migrant and undocumented communities, including those targeted by the national security state. He is a co-creator, with Aliya Pabani, of the RememberJan29.com project. You must get tickets to attend the event. This entry was posted in Events on 4, April, 2018 by admin. Bocumentary, colour, 95 min, English subtitles. In its verdict of March 9, the Islamabad High Court made it mandatory for all applicants to the army and the civil to declare their ‘true faith’, failure to do which could make one ‘guilty of betraying the state’ and ‘exploiting the Constitution’. Fundamentalist ideology and violence that has been devastating for Pakistan, especially its religious minorities. This ideology and these actions, are those of a small minority of people and have nothing to do with the beliefs and practices of the overwhelming majority of the Muslim masses. 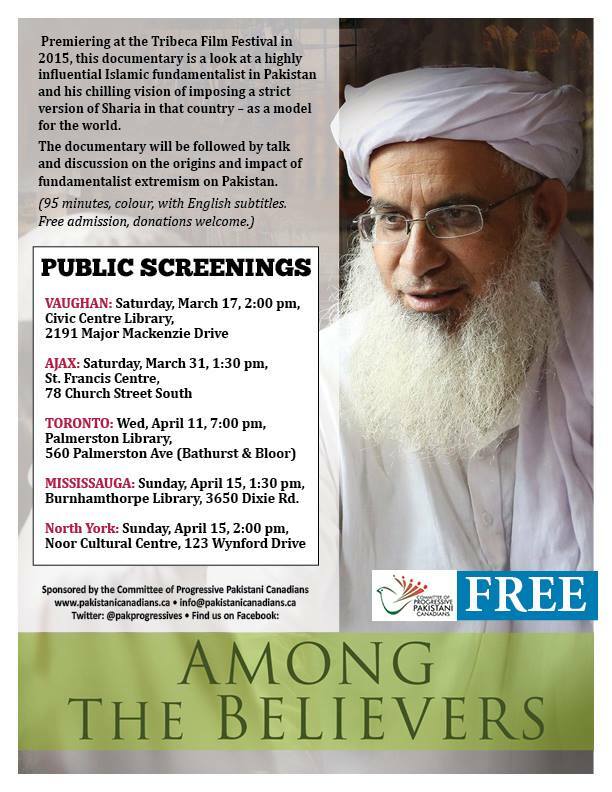 ‘Among the Believers’, featuring the renowned nuclear physicist and mathematician, and courageous human rights activist Dr. Pervez Hoodbhoy, focuses on the chilling message of the radical cleric Abdul Aziz of the Lal Masjid of Islamabad who is known for his support of Al-Qaida and the Taliban. Documentary followed by discussion on the origins and impact of fundamentalism in Pakistan and what we can do to help combat it. All welcome. Free admission; voluntary donations appreciated. MISSISSAUGA: Sunday, April 15, 2 pm. This entry was posted in Events, Film Screening on 10, March, 2018 by admin. It is with extreme sorrow that the Committee of Progressive Pakistani-Canadians announces the death of Dr. Hassan Nawaz Gardezi, one of the founding members of the CPPC, a lifelong and a tireless activist against imperialism and wars and for equality of all, justice, peace, secularism and socialism. 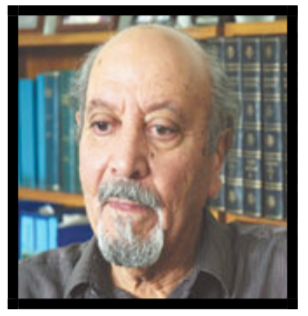 Hassan Nawaz Gardezi is a Professor Emeritus of Sociology at Algoma University College. He began teaching at Algoma University College,Sault Ste Marie, Ontario in 1970. He began his academic career as a lecturer and head of the Department of Sociology at Punjab University. He moved to North America in the late 1960s. He has written on issues relating to the political economy of Pakistan and South Asia and has been a member of the Bulletin of Concerned Asian Scholars (BCAS) editorial board since 1978. Gardezi also played a key role in creating the Pakistan Philosophical Congress (PPC), the Pakistan Sociological Association (PSA), and the Pakistan Psychological Association (PPA). Representative publications include: “The South Asian Bomb: reality and Illusion” (1999), “The Political Economy of International Labour Migration” (1995), “Understanding Pakistan: the colonial factor in societal development” (1991), Pakistan: the unstable state (1983), “Sociology in Pakistan” (1966). This entry was posted in Uncategorized on 20, April, 2017 by admin. 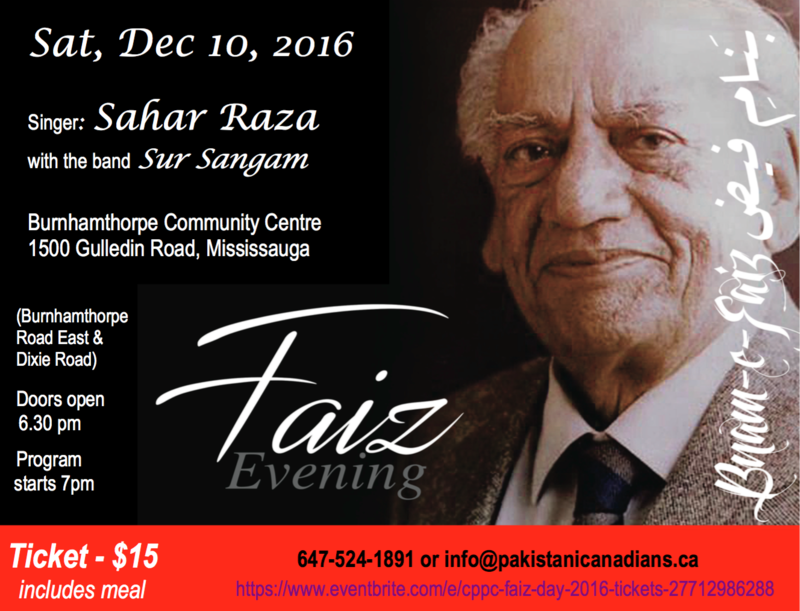 The Committee of Progressive Pakistani Canadians celebrates Faiz Day on November 21st to pay homage to the revolutionary Urdu poet, Faiz Ahmad Faiz, The program includes recitals, audio & video clippings and singing of his revolutionary and love poetry. 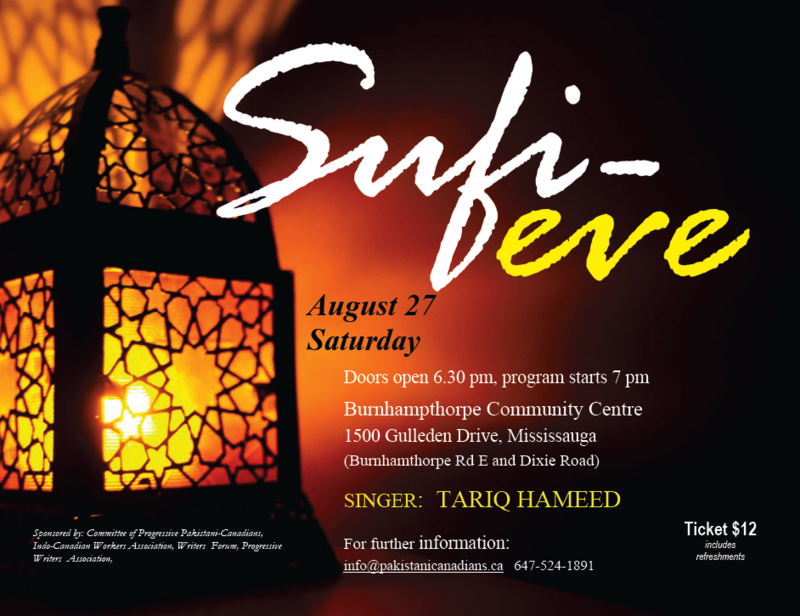 For tickets, please contact Mr. Abbas Syed at 647-524-1891. 21 November, 2015 at 06:30 p.m. This entry was posted in Events on 25, September, 2016 by admin. This entry was posted in Events on 28, June, 2016 by admin. HD. What state is Belgium in, more than one week after the terrorist attacks? We are still living in the continuity of the attacks in Paris first, and now in Brussels. The difference lies in the targeted premises – the airport and the metro – with passengers, workers, persons on their way to work, mothers, fathers. The first reaction was solidarity and unity against terror, hatred and division. Commemorations, both spontaneous and organized, were held at the Brussels Stock Exchange, on the Brussels Airport tarmac, in Charleroi, in Antwerp and in cities across the country. Everyone wanted to defend our peaceful co-existence against jihadists and racists. All victims, all standing as one, in spite of the attempts by the extreme right to disrupt this growing movement of unity. On Sunday 27 March, four hundred hooligans from the association ‘Casual United Belgium’ attempted to break the solidarity in the cosmopolitan town that is Brussels, where two-thirds of the population is of foreign origin. This incident raises many questions. How come that, right in the wake of the attacks, with all the security measures taken by the authorities, these 400 hooligans managed to go from Vilvoorde (a city just outside Brussels) to the Place de la Bourse (in the centre of Brussels) without there being any reaction. There has been a laissez-faire attitude vis-à-vis these “black-shirts” who were allowed to trample flowers, chant slogans against immigrants and perform the Nazi salute. The society is experiencing an enormous sense of bewilderment. Both in Belgium and in the rest of Europe, the extreme-right is trying to capture the anger in order to sow terror and division. HD. The investigation of the attacks reveals gross negligence on the part of the Belgian authorities. Is this worrisome, with new anti-terrorist bills on the horizon? management of the terrorist threat and the responsibility of the judiciary and the police. At different levels, we can see that the government has been unable to protect the population. Hence it is clear that its policies have to be challenged. And the PTB-PVDA members of parliament shall oppose any new anti-terrorist bill proposed by the Prime Minister who, nevertheless, wants to bring new legislation forward as early as March 29. Attention must be given to the existing mechanisms and the many shortcomings. It appears today that these attacks could have been prevented. The ministers have to provide answers as to what happened to the very clear warnings received on Ibrahim El Bakraoui and the Abdeslam brothers. Serious errors have been committed. Hence we formulated 37 precise questions to the Michel Government, for we cannot afford such shortcomings any more in the fight against terrorism. HD. What are the measures called for by the government? Prime Minister Charles Michel and his ministers are committed to mirroring the path chosen by the United States and most of the European countries like France: to gather and record as many data as possible on as many citizens as possible, while, at the same time, the Minister of Justice has confirmed at the committee of inquiry that his services are being over-stretched because of an overflow of information. Likewise, the battery of measures taken – the army on the streets, the revocation of citizenship, mass surveillance – is inefficient and may increase the burden of operational work at the expense of the tracking-down of the really dangerous subjects. Another point to emerge from these attacks is the lack of structural coordination between the different services: the federal police, the intelligence services and the local police. HD. What are the avenues proposed by the PTB-PVDA? At the criminal level, it is necessary to target the recruiters of future Syria fighters as well as other jihadists. We have to be in a position to thwart terrorist plots through targeted police work. We also have to develop prevention, and deradicalisation programmes… We have to invest in employment and in the fight against discrimination, Belgium being one of the European countries with the highest rate of discrimination in job recruitment. Europe should also stop its pro-war policy with NATO and cut off the financial, logistical and arms support to IS via its allies, including Qatar, Saudi Arabia and Turkey. This entry was posted in Events on 6, April, 2016 by admin. 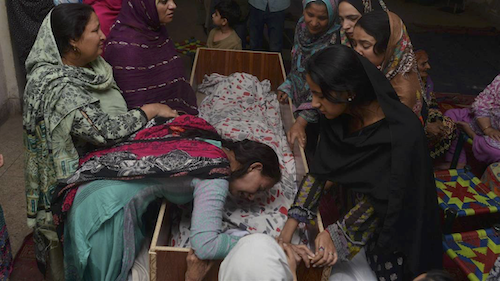 The terrorist attack targeting Christians in Gulshan-e-Iqbal Park in Lahore, Pakistan by the Jamaat-ul-Ahrar, an offshoot of the Tehreek-e-Taliban on Sunday March 27, killed about 70 innocent children, women and men and injured hundreds of others. This is the latest incidence of fundamentalist hatred, and violence against religious minorities that started with attacks against Hindus in 1948 and Ahmedis in 1953 and became especially widespread after the dictator Gen. Zia seized power in 1977 and brought in strict Islamic laws. Fundamentalism grew stronger when the US and many western governments, along with Pakistan and the Saudi and Gulf monarchies, helped strengthen the so-called mujahideen cause, in material ways and ideologically, to fight against the communist revolution in Afghanistan of April 1978. The mujahideen took over Afghanistan in 1992 but were ousted by the Taliban in 1996 whose government was officially recognized by only three countries: Pakistan, Saudi Arabia and the United Arab Emirates. From around the beginning of this century many fundamentalist organizations calling for the establishment of a ‘caliphate’ style of rule of 1,500 years ago based on sharia law, and with extremely discriminatory and violent views against religious minorities, such as the Tehrik-e-Taliban, Lashkar-e-Jhangvi, Al-Qaida, Jaish-e-Mohammad, Lashkar-e-Taeba have taken root in Pakistan. Powerful elements in Pakistan’s security, army, civil service and political establishment have helped these groups grow to foment trouble in Afghanistan and India, and to divide people along sectarian lines to divert their attention from the real issues of underdevelopment and injustice facing them, and by the Saudi and Gulf kingdoms to spread their virulent form of religion. Thousands of Shias, Ahmedis, Christians, Ismailis, Hindus and even members of some Sunni sects have been killed or injured by religious fanatics and their places of worship and property destroyed while Pakistan’s relations with its neighbours remain constantly strained. What leads members of one religion to murder people of another? Simply put: their beliefs are pure and right, those who hold other beliefs are ‘wrong’ and ‘impure’ and their elimination is justified. What can be done to change this state of affairs? All activities of extremist groups and their social and charitable organizations must be strictly banned and their leaders and activists given exemplary punishments. The campaign against foreign and local terrorist organizations by the army is a start; the hanging of Mumtaz Qadri who murdered Salman Taseer, the governor of the Punjab, in 2011 for ‘blasphemy’ is to be welcomed. Any official of the army, the internal security agencies, the civil service or politician or civilian who has aided and abetted these terrorist groups or organizations related to them, must be exposed and severely punished. Over the past three to four decades, Saudi Arabia has provided an estimated $100 billion to right-wing religious, political and educational institutions worldwide. All such funding must be stopped from entering Pakistan, and Canada for that matter, immediately and completely. Pakistan’s 2016 budget allocates 781 billion rupees – 19% of the budget – to defence (more, if hidden aspects are taken into account), 71 billion on public education and only 20 billion on health. A big chunk goes to pay Pakistan’s foreign debt. The country should free itself of the dictates of the west and its lending agencies and significantly increase educational and employment opportunities so people don’t have to rely on madrassas for education and religious organizations for basic needs. Pakistan, India and Afghanistan need to have peaceful and mutually beneficial relations so that the huge sums presently spent on armies and armaments can be spent on providing roti, kapra aur makan (food, clothing and shelter) among other necessities to their peoples. Canada’s defence spending, $14 billion in 2006 is now $20 billion. From 2001 to 2014 the Canadian government spent $18 billion in Afghanistan. Since 2011 it has provided $700 million to anti-government forces in Syria – with the U.S., Saudi Arabia, the Gulf monarchies and Turkey providing billions more resulting in tremendous destruction, dislocation and suffering in Syria. Canada must end taking part in wars against other countries and oppose Israel’s unjust treatment of the Palestinian people. It must significantly reduce its defence budget while increasing expenses on social needs such as childcare and education, healthcare and pensions etc. ‘Everyone of you, no matter to what community he belongs … no matter what his colour, caste or creed, is first, second and last a citizen of this state with equal rights, privileges, and obligations. State and religion should be separate; the results of the mixing them in Saudi Arabia, Iran, Afghanistan and Pakistan confirms this view. In 1956, Pakistan became the Islamic Republic of Pakistan. It should be renamed the People’s Republic of Pakistan – and aspire to become one. People should be free to believe and practice any religion they choose so long as it is not harmful to society or others. There should also be the freedom not to believe in religion. All discriminatory laws against religious minorities – and the one made Ahmadis non-Muslims – must be rescinded. The practice of registering the religion of citizens on passports must be done away with. Everyone, unequivocally, must be a completely equal citizen. This entry was posted in Statements on 6, April, 2016 by admin. March 21 is celebrated as the first day of spring in the Northern Hemisphere. March 21 is also celebrated around the world as the International Day for the Elimination of Racial Discrimination. A day that marks the anniversary of the tragic events of Sharpeville, South Africa, when police opened fire and killed 69 people at a peaceful demonstration against the apartheid ‘pass laws’ in 1960. This year, Toronto & York Region Labour Council in partnership with other regional labour councils across Ontario has come together for the first time to issue a joint public statement, with the support of the Ontario Federation of Labour and the Ontario Region of the Canadian Labour Congress. We feel that labour councils and their affiliated union locals have a strong and important role to play in our fight for good jobs and sustainable communities that are supported by strong public services and universally accessible social programs. 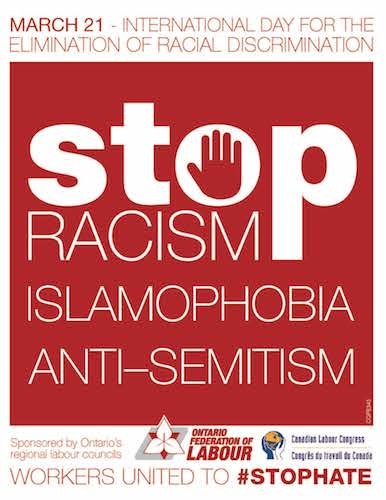 We recognize that racism, Islamophobia, anti-Semitism and all forms of prejudice, hate and discrimination ‘whether individual, cultural or systemic’ divide our communities and prevent our collective prosperity. This entry was posted in Statements on 22, March, 2016 by admin.